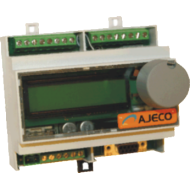 The AM06T is designed for acting as a secure communications bridge between remote equipment (RTU's) and control room SCADA. The purpose of the bridge is to bring security to the communication via encryption, time stamping and automatic routing and improve system response time and lowering communication cost. AM06T brings improved system response and communication cost savings. In addition to security in communication, the AM06T reduces communication cost in applications, where remote equipment is frequently polled. For example, breaker stations and control units in energy distribution networks are usually frequently polled by the user interface SCADA. 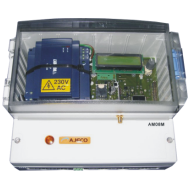 The AM06T and DSiP-solution however, does not need to be polled – the AM06T communication bridge is event driven capable of independently reporting back to the SCADA system that a particular remote unit has a changed state or needs service. This behavior removes unnecessary polling, improves system response and saves communication costs.